Close your eyes and picture Montana. What do you see? Snow-capped peaks? Sprawling green valleys? Untamed wildlife? What about a 1,780 foot-deep pit filled with more than 40 billion gallons of rusty-hued toxic water? If the latter option strikes you as odd, then you've never visited Butte, Montana, proud home to 34,000 people and the Berkeley Pit – one of the most toxic places on Earth. For just $2, you can mosey your way up to an observation deck and take in the scene: Crooked terraces crudely etched into the face of the Earth spiral down the rim of the expanse for more than a mile in all directions, gradually sloping into a stagnant pool of water with a sheen the color of a fine cabernet. The water gains its distinctive hue from the high concentration of chemicals and minerals lurking below. Manganese and iron team up to form the deep red hue at the surface, but plunge further into the depths and the surge in arsenic, aluminum, cadmium and zinc might make the water seem downright chameleonic; at deeper points in the pit's lake, the water gradually shifts to a color akin to that of Mountain Dew, Slate reports. No one fishes at Berkeley Pit because no fish can survive there. No birds scoot along the water's edge, no vegetation sprouts in, or around, the pit. In 1995, a flock of 342 snow geese decided to roost in the pit's lake for the night. By sunrise they were all dead, their insides charred from the corrosive water, according to Atlas Obscura. For years, people assumed that nothing could survive here. That is, until a team of scientists discovered hundreds of microscopic organisms teeming within the pit that exist nowhere else, according to the New York Times. In order to survive the harsh conditions in the pit, the organisms had adapted, mutating to survive. In fact, scientists believe that these unique adaptations may hold the key to curing cancer. 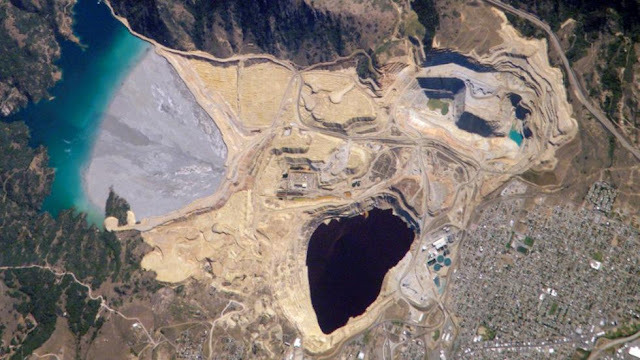 Even so, Berkeley Pit wasn't always a lake-filled crater brimming with microscopic organisms. During the late 19th and early 20th century, the site served as one of the largest gold, silver, and copper mines in the world, earning it the moniker "the richest hill on Earth," according to NASA. In 1955, mining operations shifted to "open mining" and the Anaconda Mining Co. began digging out the pit that exists today. Butte thrived off the Berkeley mines until 1982, when the mine closed down and the drainage pumps shut off – then the water began pouring in. And the torrent of water hasn't stopped in the 31 years that followed. Slate reports that the water level in the pit is rising at a rate of nearly a foot per month. If the water level continues to rise unobstructed, the toxic froth would spill over, contaminating drinking water. In recent years, concerns have been raised that these rising water levels could enter the surface soils, escaping the bedrock that currently confines it, and flood the town of Butte with toxic water, according to a Topic report. Not a fan of visiting toxic, barren pits? Click through the slideshow above to take a gander from a safe distance. 0 Response to "Inside Berkeley Pit, a Montana Tourist Trap That's One of Earth's Most Toxic Places"